Following a minor bit of tyre faffing from Rhys (nice "bang" BTW Rhys), the social group consisting Marjory, Andy, Rhys,James and Pete headed off with Andy leading from the back (demonstrating proper ride leader behaviour) and Pete at the front (demonstrating the "Darwinian" approach to ride leading). Having negotiated a bit of felling in Shepherds Wood we made our way through (around actually) the ford and up the allotment via the scenic route. We made our way into Doodles via the new path by the road and enjoyed a very nice sunset from the woods - mixed opinions were shared about old doodles vs new doodles - the paint someone had use to mark the trees was unanimously frowned upon ! We then bounced and skipped our way along Transistor and down "the middle one" (we must name that descent [Its called Stubborn Erection - Al]) back up to Canimore woods to try the usual bits such as Vlad, Pump and Vancouver plus a couple that were new for some. 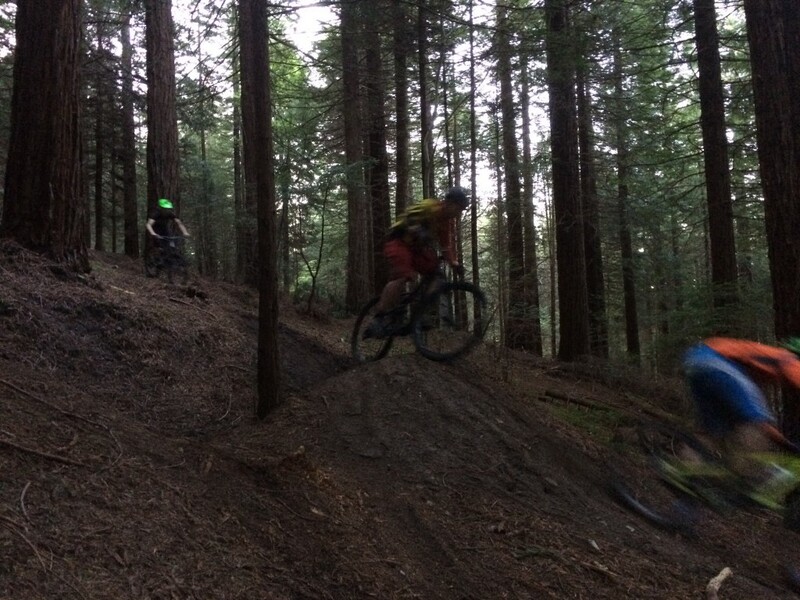 As the time drew on, and the need for cider became pressing for Andy, we headed back around Centre Parcs with one last "hurrah" by way of a quick blast down Fenceline. The trouble with the faster boys is that they are always in such a hurry to get to where they are going, they miss the fun bits getting there. So it was a Nath missed both lefts in Shepherds and we rode out the wrong side and missed the ford. No matter, it'll all still be there next week. Again, faster boys, they get fixated. I made the mistake of mentioning the Strava time of a local roadie up the BCC Climb to Chris as we rode along the road to it, and duly he fired straight on up at warp speed, missing the easier, more fun way on the left (why always the left?). We regroupped as 8 at the top and headed for Fencline. I say headed, 'cos whilst Diz added some air to his tyres bored minds plotted a more direct route down. 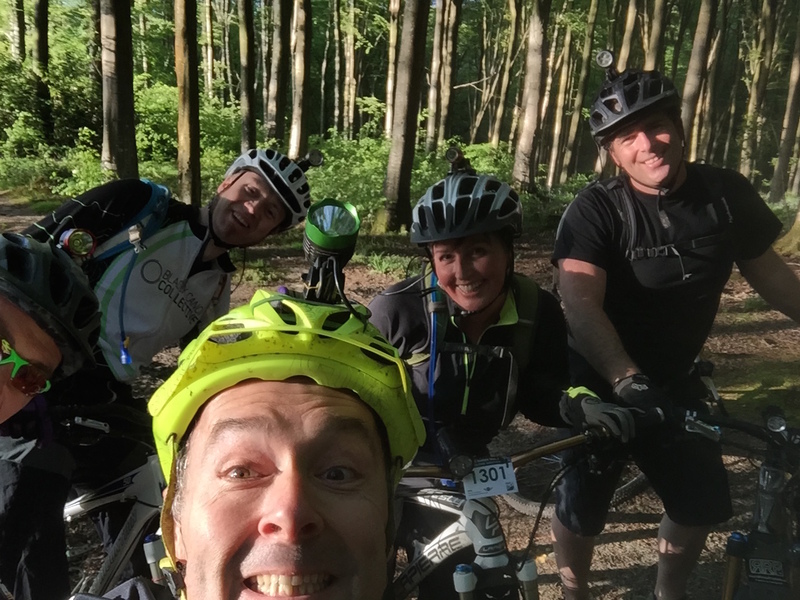 Direct, loamy and bloody good fun as it turned out, which cheering from 4 chaps also out halfway down. I myself even cleared a double, on my XC hardtail with my saddle up - it was new, I knew no better and just rode it! Phew. Up to Jihadi's, or Wigwams as its been renamed to avoid annoying terrorists, and straight back down with joyful abandon. Bumped into Curtis out riding his dogs to. Up, Bonnet, Duk, Endurex, Duk, that new bit, Vlad, Jeremy (where we waved George off home), Transistor and Doodles to finish. At which point whilst heading up to the gate my legs knew I'm better at being social than riding XC. Good job it was downhill to the pub! Some direct, some via BBMS. Its all good and no lights! I’m out tonight … can we have a gentle lie down group?